Murder by Gaslight: The Northwood Murderer. When senseless a murder occurred with no obvious suspects, a community’s worst fear was that some transient had drifted into town, done his dirty work and left without a trace. The roads of rural America, in the ninetieth century, were filled with tramps; some were honest men looking for work in hard economic times, others were aimless ne’er-do-wells, running from or heading toward trouble. When these men turned to murder they were likely to get away without capture and were prone to kill again. But every now and then a wandering killer was caught and his whole bloody itinerary made public. Such was the case of Franklin B. Evans, known as the Northwood Murderer. On October 30, 1850, in the town of Derry, New Hampshire, the five-year-old daughter of Stephen Mills, one of a set of twins, was kidnapped from her home. The parents had left them alone and someone had climbed through a window into the house and taken the girl. Mills offered what he could afford, a $100 reward for her return. The police had suspects but no evidence, and no trace of the missing girl was ever found. Twelve years later, in the town of Strong, Maine, near Augusta, on the morning of September 14, 1862, nine-year-old Lura Ville Libby walked to church alone. She never returned. A search began at 4:00 Sunday afternoon, and the next day her body was found buried under the turf in the woods about half a mile from her home. Her dress had been removed and she had been raped; her head was cut and bruised and her throat slashed, nearly severing the head. The murder, of course, caused intense excitement in the town of Strong, and a citizen’s committee promptly offered a $1,000 reward for the capture of the killer. Suspicion immediately fell on the Libby’s farmhand, Lawrence Doyle, who had behaved strangely that morning and had explicitly asked Mr. Libby if he would be accompanying Lura to church. At the coroner’s inquest a witness reported that Doyle had told him about a murder in Canada where the body was buried in the same way as Lura’s. For these and other minor suspicions, Lawrence Doyle was held for trial. The evidence presented at the trial was highly circumstantial and the jury was deadlocked, seven for conviction, five for acquittal. At his second trial, Doyle was convicted and was sentenced to hang. Doyle's attorney E. F. Pillsbury, was thoroughly convinced of his client’s innocence, and helped him persuade the Governor and Executive Council to commute his sentence to life in prison. When Doyle died in prison two years later, Pillsbury continued the fight to exonerate him and find the real killer. In 1865 in the town of Roxbury, Massachusetts (which became part of Boston three years later), two children, John and Isabella Joyce, were found dead in Bussey’s Woods. John, age 12, and Isabella, age14, were staying with their grandmother in Boston, and on Monday, June 12, told her they were going to take a horse car to nearby May’s Woods to make wreathes. They were not seen again until their bodies were found the following Sunday. They apparently had missed their stop and taken the car to the end of the line. 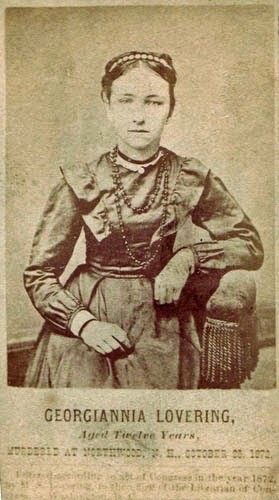 The Body of Isabella Joyce. The murder scene was horrific. Isabella had been raped, and the condition of her clothing indicated that she had put up a fight before succumbing. She was stabbed twenty-seven times in the abdomen, possibly an attempt to hide the fact that she had been raped. John, frozen with fear over what was happening to his sister, did not run until it was too late. He was also stabbed to death. There were no witnesses, of course, but one woman remembered seeing a frightening stranger, with long, disheveled black hair, near Bussey's woods that day. The first suspect in this murder was Thomas Ainsley, a painter who had some connection to the Joyce family, but Ainsley had an alibi and was soon released. Early in July a number of tips pointed to a man named John Stewart who had been a bounty jumper during the Civil War. He would join an army unit for the bounty they were paying, then desert soon after. He had done this in nine different places. But it turned out that John Stewart also had an alibi for June 12. It wasn’t until the following March that the police had another viable suspect. A tramp named Charles Aaron Dodge, alias “Scratch Gravel,” was being held in Fitchburg for house breaking. He gave the impression of being something more than a burglar, telling police, “I don't care a damn about being arrested for stealing that silver, but if you knew something I had done it would be a feather in your cap. This little thing of three months don't amount to anything.” The police planted a detective in the Fitchburg jail who overheard enough loose talk from Scratch Gravel to charge him with the murder of the Joyce children. But Scratch Gravel was able to prove that he was not even in Massachusetts that day. 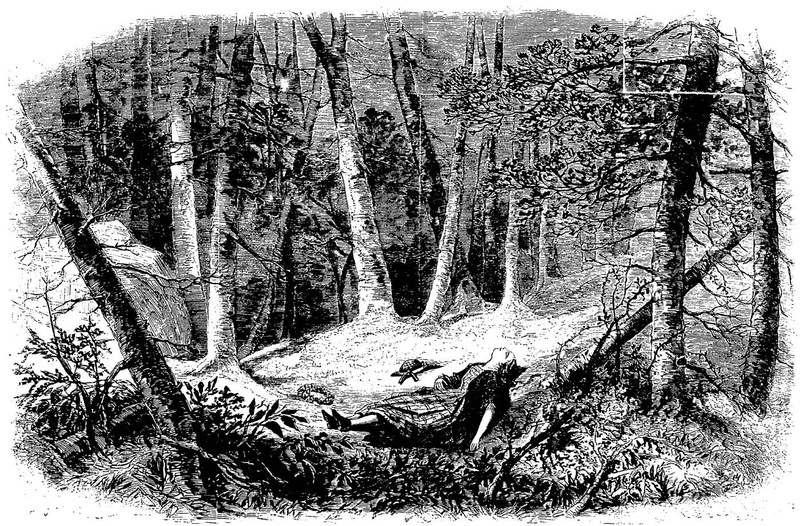 In December 1866 the skeleton of a man was found Needham Woods, not far from Boston, and a quantity of hair was found nearby which resembled the hair of the man seen in Bussey’s woods the day of the murder. From this scant clew, the skeleton was postulated to be the man who killed the Joyce children. He had taken to the woods to elude capture and died there. While not everyone was satisfied with this conclusion, the case was essentially closed. There was nothing to connect these three heinous New England crimes until October 25, 1872 when 13-year-old Gorgianna Lovering, disappeared from her home in Northwood, New Hampshire. This time there was little question who was responsible—her 64-year-old great-uncle, Franklin Evans, who had previously made “improper advances” to Georgianna. Franklin Evans had gray hair, wore a long gray beard, and had dark, piercing eyes, giving him a perpetually sinister expression. He had traveled extensively through New England and eastern Canada, sometimes as an Adventist preacher, sometimes as a self-styled “botanic physician.” He had married three times and had a son in Derry, New Hampshire, and a daughter in Lawrence, Massachusetts. Since the previous June he had been living with his sister and her husband, Sylvester Day. Their granddaughter Georgianna was also staying with them while her widowed mother was away. Evans set snares in the woods to catch partridges and had shown them to Georgianna. On the day of her disappearance, Evans had asked Georgianna to check his traps as he had to go to work. Georgianna went into the woods to check the traps and never came out. Evans did not go to work and was seen entering the woods that morning. When Gerogianna had not returned by10:00 the family began searching for her. On the ground in the woods they found her apron and a broken comb recognized as hers. News of the disappearance traveled fast and by the end of the day more than a hundred people were in the woods searching for Georgianna Lovering. Franklin Evans was immediately suspected of abducting his grandniece and two days later a warrant was issued for his arrest. At first Evans denied any connection to the disappearance, but after prolonged questioning by Sheriff Henry A. Drew, he said she was alive and he would tell where she was if the sheriff promised that he would not be harmed. Evans said he had agreed to help a man named Aaron Webster, of Kingston, kidnap Georgianna. The following day Sheriff Drew took Evans to Kingston to look for Webster, but they found no trace of them. Evans said that maybe Webster had been from Kensington, so they traveled there. When the Kensington search also failed to pan out, Evans said maybe it was Candia, but Sheriff Drew had lost all confidence in Evans and took him back to his own home in Stafford, New Hampshire. Believing his deal with the sheriff would protect him from prosecution, Evans agreed to take Drew to the body, and although it was nearly midnight, they left for the woods. Evens led Drew through the woods, then through a swamp, till they came to a fallen tree and Evans showed him the body, hidden under a pile of leaves. By the light of his lantern Sheriff Drew was shocked to see the mutilated body of Georgianna Lovering. The body was later examined by a doctor who found finger marks on her neck where she was strangled. But the most horrible discovery was that the killer had cut away her sexual organs as well as portion of her bladder. The town of Exeter, New Hampshire where the trial was held, was inundated with spectators. Hotels were filled to capacity and many more people tried to get into the courtroom than the building could hold. But if they were expecting a long dramatic trial they were sadly disappointed, the session lasted only two days. The family testified to the circumstances of Georgianna’s disappearance, several witnesses testified to seeing Evans enter the woods that morning, the sheriff told of Evans leading him to the body, and the examining doctor told of the body’s condition. The only defense possible was insanity, and Evans’s attorneys provided little beyond the crime itself to indicate that Evans was insane. His jailers testified that Evans was subject to fits of insanity, including attempted suicide, but it did not help his cause. The jury returned a verdict of guilty after only forty-five minutes of deliberation. Evans was sentenced to hang on the third Tuesday of February, 1874. In the year between his sentencing and his execution, Franklin Evans was visited by a number of lawmen and reporters attempting to connect Evans with other New England murders. He was known to have been in Derry at the time the Mills girl was kidnapped, and reportedly had been a suspect. Through his connection to the Adventists, it was determined that Evans had been in Boston when the Joyce murders took place. E. F. Pillsbury, attorney to Lawrence Doyle, convicted of the murder of Lula Libby, believed he had evidence that Evans was her killer. The Boston Daily Evening Traveler sent out a “commissioner” to get to the bottom of all of these allegations, and reported what he learned. 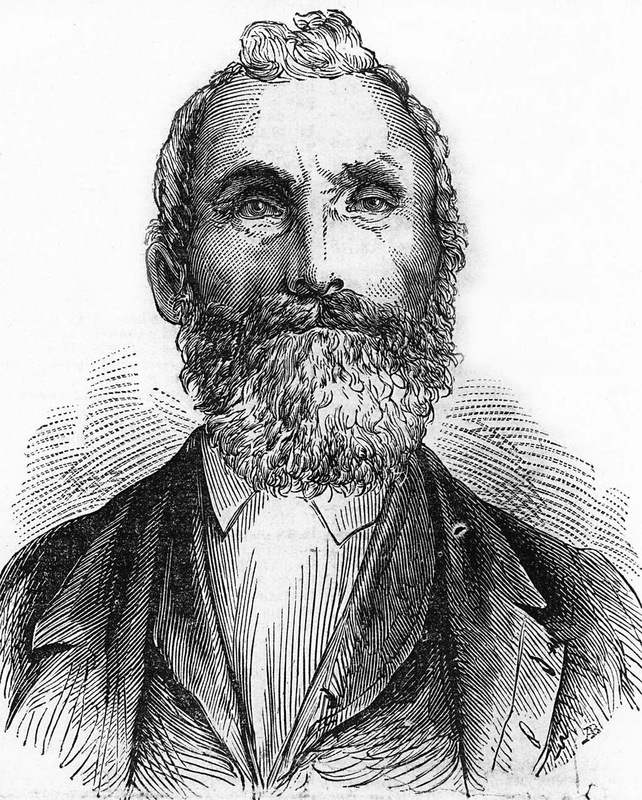 Sheriff Drew had pressed Evans on his whereabouts during the years prior to the murder. Evans said he had spent much time in Derry, New Hampshire, and when questioned about the Mills kidnapping, Evans admitted that he had taken the child, but her body would never be found. Everyone interviewed in Derry believed that Evans’s confession was correct. He had the reputation of a man of low character, and he was quite familiar with the Mills house. It was also alleged that two years later he sold the skeleton of a child to a physician in Lawrence, Massachusetts. Beyond the hints he gave Drew he would not admit to murdering the Libby girl. But attorney E. F. Pillsbury was convinced that Evans did it; he claimed that Evans had preached in Augusta, and that the Libbys were Adventists who had entertained Evans in their house. This was verified by a “respectable lady” of Augusta who knew the Libbys. Pillsbury also said that there were also aspects of the crime not reported by the newspapers that implicated Evans. Evans also confessed to murdering the Mills child. He heard moaning from inside the house, climbed in the window and found her sitting on the floor, apparently very sick. He concluded that she would probably not live until morning and he wanted a body to examine for “surgical purposes” so he took her to the woods and strangled her. He stopped his examination when he found she had a deformed hip and spine, and buried the body in the woods under a chestnut stump, in a spot he was never again able to find. These were the only two murders Evan’s confessed to. He admitted to theft, counterfeiting and attempted insurance fraud, but said he was entirely innocent of the murders he was accused of in Boston, Maine, and elsewhere. The confession was dictated to the warden and chaplain of the prison. They wrote it down and read it back to him and he accepted it as correct and signed it. They explained that much of what Evans said was “too gross and indelicate to be written or read” and had to be rephrased. 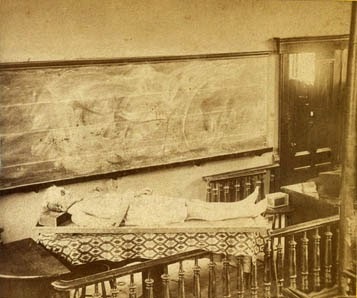 Franklin Evans on the Dissecting Table, Dartmouth College. Whether he committed only the two confessed murders or was the killer of five or more, as many believed, Franklin Evans was, as he was often described, a monster. In death the wandering Northwood Murderer finally found a home; in accordance with his lasts request Evans’s body was sold to Dartmouth College for dissection, the proceeds of the sale going to his son. Franklin Evans’s skeleton resided for years in the college’s anatomical museum. Fogg, Alonzo J. Statistics and Gazetteer of New-Hampshire., The. Concord: D. L. Guernsey Bookseller and Publisher, 1874. Knudsen, Milli S. Hard Time in Concord New Hampshire. Westminster: Heritage Boos, 2008. "A Terrible Tragedy In Roxbury." Providence Evening Press 18 Jun 1865. "B. Franklin Evans." Boston Traveler 18 Feb 1873. "Bussey's Woods." Boston Traveler 7 Feb 1873. "Child Lost." New Hampshire Patriot and State Gazette 14 Nov 1850. "Concord and Vicinity Franklin B.." New Hampshire Patriot and State Gazette 18 Feb 1874. "Confession of Franklin B. Evans." New Hampshire Sentinel 26 Feb 1874. "Discovery of the Skeleton the Supposed Murder of the Joyce Children." Cincinnati Daily Enquirer 21 Dec 1866. "Franklin County." Portland Daily Press 12 Feb 1873. "Girl Outraged and Murdered by her Uncle." Springfield Republican 5 Nov 1872. "Horrible Murder And Outrage." Hartford Daily Courant 20 Jun 1865. "The Case of 'Scratch Gravel' Investigation by the Legislature." Boston Daily Advertiser 26 Apr 1866. "The Murder of the Joyce Children." Age 24 Apr 1866. "The Murder Trials at Farmington.." Daily Eastern Argus 31 Oct 1863. "The New Hampshire Horror.." New York Herald 5 Nov 1872. "The West Roxbury Tragedy." Saturday Evening Gazette 8 Jul 1865. "The West Roxbury Tragedy the Murderer Discovered." Boston Journal 9 Mar 1866. "Trial of the Northwood Murderer." New Hampshire Patriot and State Gazette 5 Feb 1873. New York Public Library Digital Collections: Evans, the Northwood murderer, on the Dissecting table of the Medical College [Dartmouth College]. I think he's guilty of all the murders. Too coincidental he was in right places at right time for all of them.